When Warren Gillis was jailed in Minnesota, so was his service dog, Lurch. 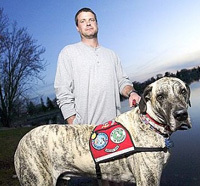 The Great Dane, also appeared in court when Gillis was charged with domestic assault. Lurch acts as a service dog for Gillis, who is epilleptic, but he is also locally well known as a therapy dog and often visits hospitals and retirement homes. The presiding judge ruled that Lurch wouldn’t again be allowed in the jail or in court, since the letter on file from a doctor didn’t specifically state the dog was needed by Gillis in jail or in court. Mower Co. Sheriff Terese Amazi stated she doesn’t have the staffing to take care of a dog in jail. I think Judge Fred Wellmann and Sheriff Amazi may need to familiarize themselves better with The Americans With Disabilities Act (ADA) and The Civil Right of Institutionalized Persons Act (CRIPA). The ADA requires that the service dog may not be removed from a detention facility, unless accomodations can be made that will reasonably substitute the service provided by the animal. The judge and the sheriff did, in fact, check it out.